Preheat oven to 350°F. In a medium nonstick skillet, brown drumsticks over medium-high heat. Meanwhile, spray a 2-quart round or oval casserole dish with no-stick spray. Add rice, peppers, celery, onion, chicken broth and hot sauce and stir together. When drumsticks are browned, remove from heat and sprinkle with cayenne to taste. Lay drumsticks in a single layer over rice mixture. 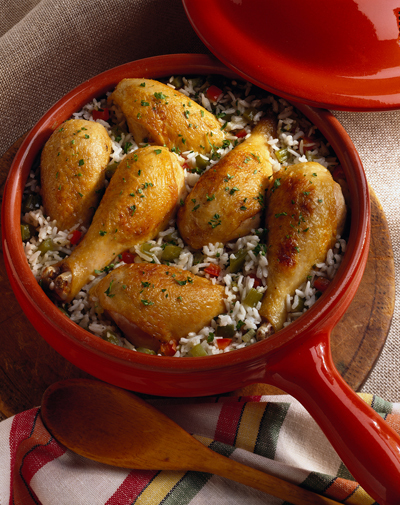 Cover and bake for 50 to 60 minutes or until rice is cooked and chicken reaches an internal temperature of 180°F. Recipe and photo courtesy of National Chicken Council Used with permission.